Medical simulation research and development firm SIMnext has introduced a new DR Doppler dynamic ultrasonography training system. DR Doppler is claimed to be the first ultrasound training solution duplicating irregular blood flow and velocity patterns based on real human data through a series of customized, application driven training modules and supporting anatomies. Based on the firm’s patented waveform emulator, the DR Doppler features a proprietary system that communicates through wireless communications to access specific training modules available through the DR Doppler app. The system can be used in a hospital system to train clinicians to use ultrasound at the point of diagnosis, helping in reducing medical errors and improve overall patient experiences and outcomes. Training modules that are available for DR Doppler include the Core Competency Trainer (CCT) for general ultrasound technique. Other training modules and anatomic phantoms are also available for carotid (stenosis), femoral (DVT), testicular (torsion), and cerebral (TCD). The firm is also developing new training modules with the supporting anatomic phantoms for appendix, vertebral, pregnancy, kidney, hepatic, pulmonary, transvaginal and full abdomen pathologies. SIMnext has collaborated with UK-based Limbs & Things to distribute DR Doppler to the customers. SIMnext executive director Paul Pribaz said: "The launch of this system completely changes the way clinicians develop their skill set and diagnostic abilities using ultrasound, offering them a more realistic training environment than ever before." 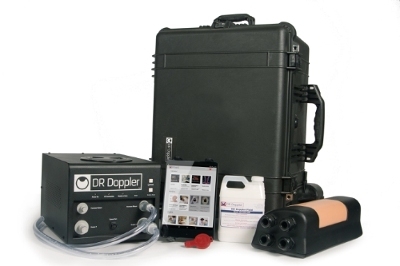 Image: The complete DR Doppler ultrasound training system. Photo: courtesy of PRNewsFoto / SIMnext, LLC.